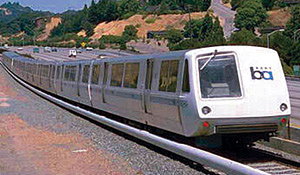 Thanks to assistance from the Berkeley Seismological Laboratory, the San Francisco Bay Area Rapid Transit (BART) system can now automatically brake trains when earthquakes threaten to rattle the Bay Area, allowing perhaps tens of seconds to a minute for trains to slow down before the ground starts to shake. Instituted last month, the earthquake early warning system was created with the help of University of California, Berkeley, seismologists who hooked BART into data flowing from the more than 200 stations throughout Northern California of the California Integrated Seismic Network. Electronic signals from seismic stations travel much faster than seismic waves. For quakes outside the Bay Area, these data give BART’s central computers advance notice that shaking is on the way; for quakes in the Bay Area, they provide more rapid warning. If the messages from the seismic network indicate ground motion above a certain threshold, the central computers, which supervise train performance, institute what BART calls “service” braking, which is a normal slowdown to 26 miles per hour. BART’s manager of computer systems engineering Kevin Copley will describe BART’s early warning system in a talk this afternoon (1-3 p.m. Sept. 27) organized by the Bay Area Earthquake Alliance. Copley will be joined by UC Berkeley seismologist Peggy Hellweg, who will discuss plans for a broader early warning system along the Pacific Coast that would rival Japan’s well-known earthquake early warning system, which not only slows trains but alerts schools and can even automatically shut valves at industrial sites. The talks are free and open to the public in the East Bay Municipal Utility District board room at 375 11th St. in Oakland. BART has long had accelerometers – devices that detect strong ground movement – positioned along the tracks. They ring an alarm bell in the Central Control Facility when the local shaking exceeds a specific threshold. Supervisors then made the decision whether to radio train operators and tell them to initiate emergency braking to a full stop. A year ago, BART instituted automatic service braking when the system’s own shake sensors detect ground movement. That only works when shaking reaches the BART system, however. But the new system gives warning as soon as shaking is felt at remote sensors, which can be sooner because of the time it takes for the strong shaking to radiate from the epicenter. The California Integrated Seismic Network is a collaboration among various groups that operate seismic sensors, including the Berkeley Seismological Laboratory, U.S. Geological Survey (USGS), California Geological Survey, Caltech Seismological Laboratory and the California Emergency Management Agency. Allen and other seismologists will be in Washington, D.C., on Friday, Sept. 28, to talk with House and Senate staffers about the benefits of earthquake early warning systems. Development of an earthquake early warning system has been supported in part by funding from the Gordon and Betty Moore Foundation to a team of seismologists from UC Berkeley; Caltech, the University of Washington, Seattle, and the USGS. The system is also supported by ongoing funding from corporate and government partners of the Berkeley Seismological Laboratory and of Caltech.